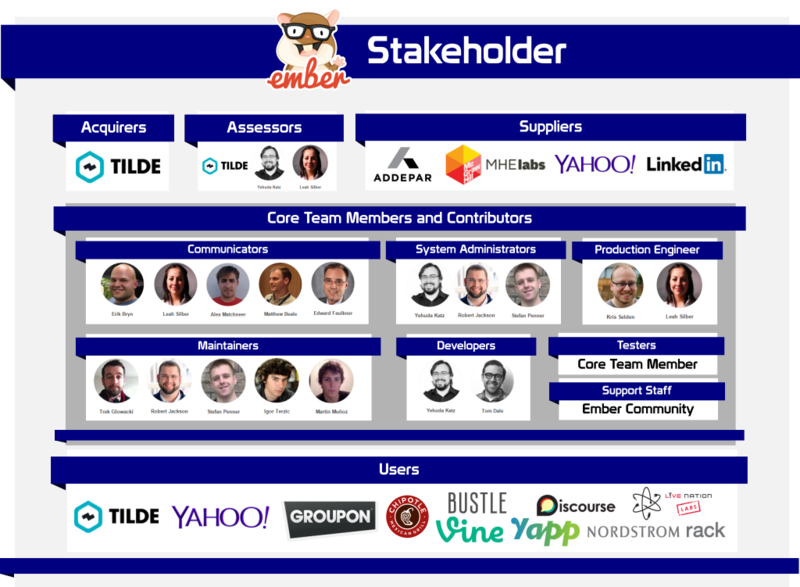 Ember, the brainchild of Yehuda Katz (@wycats), is maintained by a large community of developers and consumers always striving for novelty and simplicity. It allows developers to build scalable web applications and is used by major websites such as Yahoo! and LinkedIn. Currently, it is run by thousands of contributing members from all over the world. This chapter will describe the Ember framework according to multiple perspectives, including the context view, which describes the interaction with its environment. The development view, then, describes Ember&apos;s different modules and layers. Subsequently, Ember&apos;s features and functionalities are discussed in the feature list and deployment view. Finally, the evolution perspective carves the roadmap for future releases. Evolution: How has Ember become the framework it is today? So, why does Ember change? Over the past few weeks, team-Ember, from the Delft Students on Software Architecture (DESOSA)-group, have dived into the framework by stepping through its various components from different perspectives and views. With these insights, we hope to contribute to the framework by both solving issues and make it accessible for readers to contribute too. These issues can vary from bugs to potential new features. In the end, we will bring all the different views and perspectives together to examine whether Ember&apos;s architecture is robust or if particular components have to be improved or extended. Before doing so, first, we will guide the reader through Ember&apos;s basics. Figure 1 presents the described relations between the router, routes, models, templates and components . The Ember society consists of a large community of thousands of software developers, architects, users, and testers, with most of them having another job and working voluntarily on the Ember.js project. The search for detecting the most relevant stakeholders led immediately to Ember&apos;s Core Team Members. It appeared that only a limited group of Core Members were actively involved in approving or denying potential contributions. 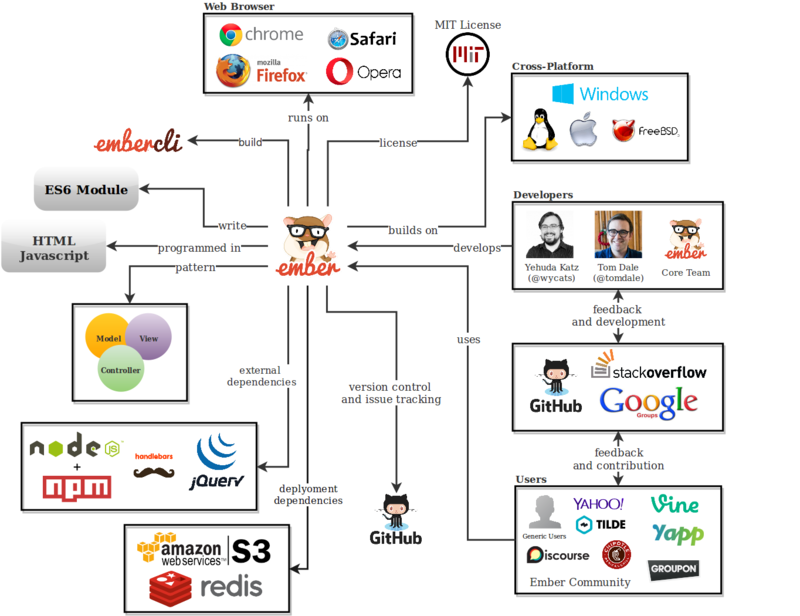 For a detailed presentation of the community behind Ember.js, see Figure 2. For a clear interpretation and explanation of terms, please consider Rozanski & Woods (2011). Kris Selden (@krisselden), important production engineer of the Ember framework. 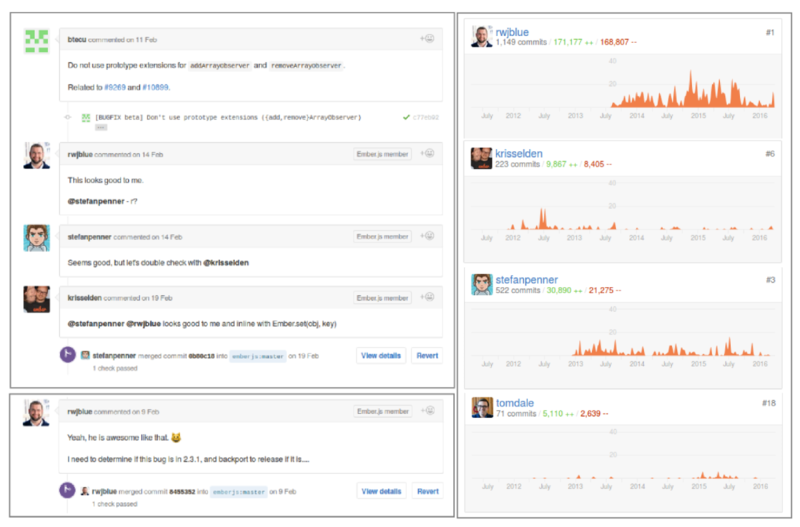 Based on GitHub activities as seen in Figure 3, one can conclude that mainly Robert Jackson, Stefan Penner, Tom Dale and Kris Selden are involved in approving or denying contributions to the Ember framework. Ember is used on many popular websites, including Yahoo! and LinkedIn. Some of these larger users support the framework financially. Other, smaller users, can help improve the framework by reporting bugs, performance issues or proposing new features. Therefore, many of the fixed bugs are dedicated to users. Furthermore, small users can also make donations to the project, buy unique Ember.js gear or participate in Ember.js courses and conferences, to support future development of the framework. To maintain and help the large Ember community, a couple of third party platforms are used. For user support, Ember uses StackOverflow. Other channels for user support can be found in the Ember Community on Slack, the IRC channel on Freenode IRC or within Google Groups. For Ember learning resources (podcasts, videos, blog posts, books and so on) almost all Core Team Members have public channels on either YouTube or Vimeo. Most of these platforms are also able to give feedback for future development. Finally, for developers, Ember’s source code is, of course, available on GitHub. Lastly, the figure shows that Ember applications can be built on a cross-platform server running Node.js, such as Windows, OSX, Linux, and FreeBSD. The framework can be rendered on multiple web browsers like Google Chrome, Firefox, Opera, and Safari. Also, Ember uses an efficient deployment technique using Redis and Amazon S3, which will be discussed in the later section. As a framework, Ember.js makes use of the Model-View-Controller (MVC) design pattern for the users to build their applications. MVC is used for relating user interface to the underlying model, providing several advantages, such as : clean separation of concerns, simplified testing, improved scalability, easier maintenance, reuse of code and decoupling of application layers. 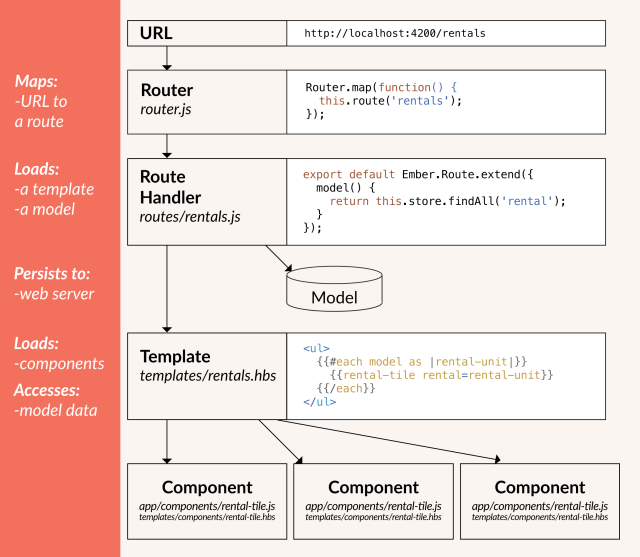 The different modules and components of Ember’s framework are presented in Figure 5 . This section starts discussing the modular design that forms the foundations of Ember.js to gain a deeper understanding of Ember’s architecture. Furthermore, some standardization aspects and Ember’s codeline organization are considered. Firstly, in Figure 4, the yellow block describes Ember’s models. Models represent the underlying data that an application presents to the user. There is no doubt that models can vary heavily through different apps. A photo sharing application might have, for example, a Photo model to show a specific photo, whilst a PhotoAlbum represents a group of pictures. Contrary, a shopping website would probably have other models, such as ShoppingBag or Payment. Note that each model testable in isolation and can easily be changed or replaced. They work with the router by a find(id) command. Thus, each module has its identity (id) which is inside its store. The REST adapter loads and saves the various records. As presented, data flows from models to templates in top-down fashion via bindings. Secondly, controllers are shown. In recent versions of Ember.js, controllers are being replaced by components, making them less important in the framework. The controller module is only being used to pass user actions through the different layers when moving from components to routes. Note that they are also testable in isolation. Controllers consist of object controllers and array controllers. Array controller contain lists of elements and also interact with object controller. Thirdly, views render HTML elements and manage the user interface. In this, DOM (Document Object Model) helps with event interactions, like mouse overs and key ups. Handlebars are just like HTML bars which are self-updating templates. Note that controllers need views to work. Fourthly, templates are more or fewer components of the view module. They more or less boost the app’s user interface. They consist of the bound expressions, firing events, conditions, scope of the code and nesting (like nested loops). It helps in firing events from the view to the router. Thus, it defines the basic building blocks for the app’s (front-end) structure. Finally, routers update the model based on the templates (events) and the controller. It consists of the application state, URL, and different route classes. The URL interacts with the application state and the route classes to forward the events to the model. As a complex system, Ember.js source code can be classified into several modules as seen in Figure 6. Whilst Ember’s design pattern for developers is modular and easy to interpret, the application’s source code is not. 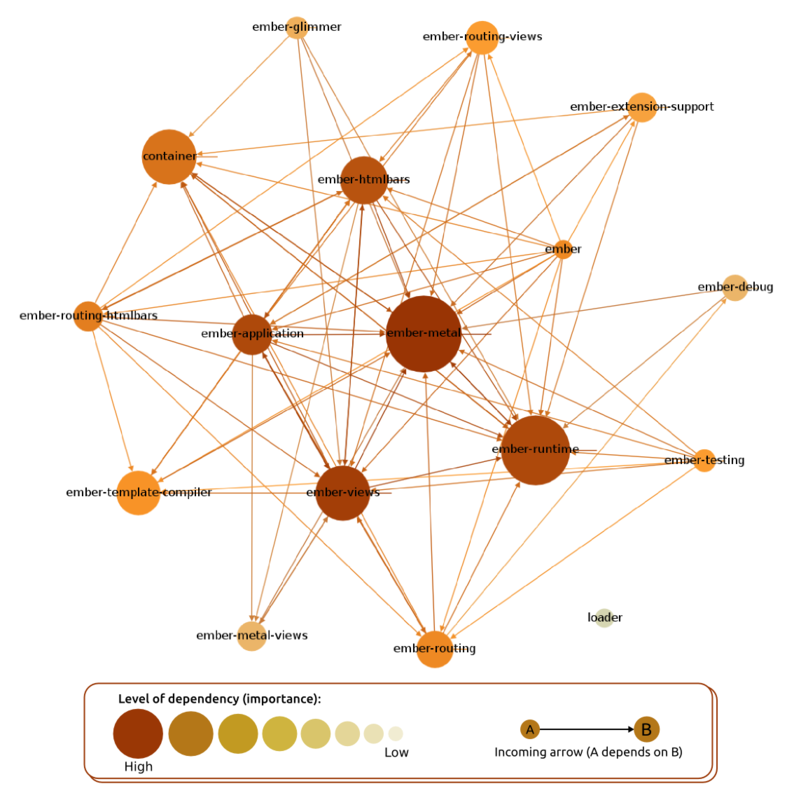 It is difficult to group and partition modules in Ember.js into different layers as they form a complex dependency pattern (see Figure 7; this figure is constructed by visualizing Ember.js’s source code through GraphViz). Some of these modules interact with third party modules as well, making the interaction pattern even more complex. The relatively clear defined modules prevent develop functions multiple times and make it easy to localize bugs and performance issues, though. However, the dependencies between the different modules make it hard to change specific components, because it can be hard to predict its consequences for other modules. Subsequently, this has a negative impact on both scalability and maintainability of the Ember.js framework. This is in particular true for ember-metal, ember-runtime and ember-views. Ember&apos;s internals and most of the code we will write in our applications takes place in a run loop. The core codebase of Ember uses ES6 modules which help in improving the runtime i.e. if we have things set up properly in our development environment, then we can import just the parts of Ember.js that we want to use. Every developer and contributor should perform a unit test, typically using Qunit, before submitting a PR (Pull Request) which potentially changes parts of the code. Ember.js implements a continuous integration platform called Travis CI. It is used to test each PR before it is merged. When developers submit a modification of code, Travis will automatically be launched and a note will be added to the PR. The term codeline is mainly used to describe the arrangement of the source code files. 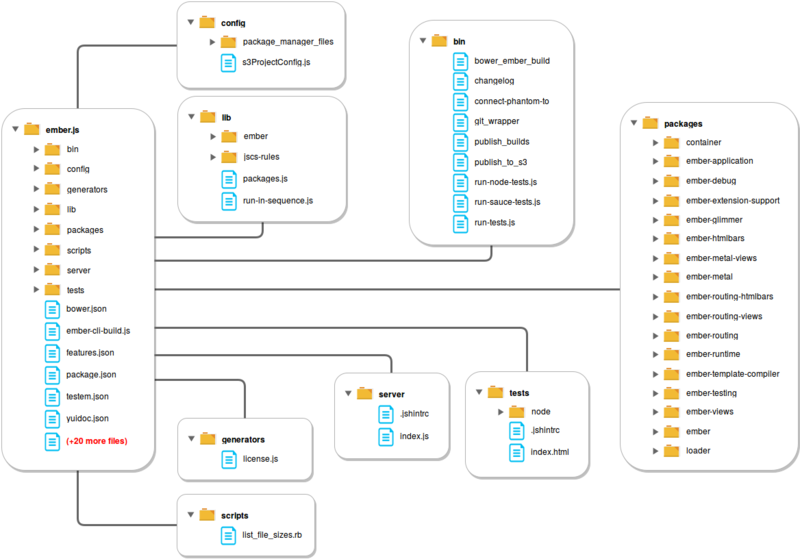 Ember’s codeline can be organized into a well-defined structure as shown in Figure 8. The Ember.js directory consists of main folders like bin, ember.js and packages. In the root directory, bower.json and ember-cli-build.js are the most important files. bower.json is a Bower package manager file which helps managing dependencies, whilst ember-cli-build.js is the build configuration to be used by ember-cli. In bin folder, the changelog keeps track of the changes in version and the commits. Packages consist of the main modules which have been described in the Ember’s Module Organization. The config folder contains the configuration files that handle the mapping of a specific configuration with corresponding files. Generators contain the license and lib consists of the configurations of packages. This section provides a generic insight in the main features of the Ember.js framework along with the perspective of the different stakeholders (see Figure 2). We have seen that there are two important stakeholder groups, namely the actual users of the framework and its developers team. It appears that Ember.js has dozens of features, mainly for their users. Here, a couple of relevant features for users and one important feature for both users and developers are discussed. Ember provides a robust data model using Ember Data. It retrieves models from the server as JSON, save updates to the server and create new models in browsers. Ember Data can be configured to connect with different types of backends without writing any networking code by accomodating a relevant adapter provided in the Ember Data Adapters collection. Users can easily extend the default Adapter if they work with non-standard backend using DS.JSONAPIAdapter. Secondly, Ember uses routers as the URL routing mechanism. It has four options, namely: history (uses the HTML5 History API), hash (uses anchor-based URLs), auto (uses history if supported by the user&apos;s browser and falls back to hash otherwise) and none (doesn&apos;t update the URL). This option can be configured by users in config/environment.js under ENV.locationType. Ember uses also controllers that allow developers to decorate models with display logic. Ember Controller has two different types: either automatic or custom. They can be selected and configured using ember-cli. The custom controller provides flexibility to users to extend the behavior of one of the automatically generated controller. Thirdly, Glimmer is used as the latest rendering engine of Ember.js. It differentiates between static and dynamic components, because of expressiveness of Handlebar&apos;s templates . Glimmer can be configured through feature list during the build process. Finally, Ember users can configure their application in a configuration file located in config/environment. This is a default file generated by Ember CLI. Here, the users can change the default environment by defining ENV object, which is currently limited to three: development, test and production . To conclude, users can benefit from Ember’s flexibility by choosing between three different environments. The users can disable and enable features in each of environments depending on requirements they have. Ember users can configure Ember CLI by adding configuration codes to the .ember-cli file in the application root. true - The feature is present and enabled: the code behind the flag is always enabled in the generated build. null - The feature is present but disabled in the build output. It must be enabled at runtime. false - The feature is entirely disabled: the code behind the flag is not present in the generated build. The description of newly-flagged features can be found in FEATURES.md file located in master branch on Github. In this file, developers explain what certain features do and the link to the original pull request is given. This, so that users get knowledge regarding how the feature is implemented in Ember.js. Newly-flagged features have a Feature Life-Cycle, starting from Canary, Beta, to Release phase. In Beta phase, Ember’s Core Team will evaluate each of new features that come from Canary phase. When the features are considered to be stable, they are made available in the next beta phase and enabled by default. As the beta cycle completed, the features will available in the release phase and becomes part of Ember framework . An example of a newly-flagged feature is Glimmer rendering engine, which is still in Beta phase. Glimmer potentially is a significant improvement to the Ember.js framework, as can be seen in pull request #10501. For this reason, this feature is flagged as null in features.json file. Considering the vast use of Ember.js, it is important to describe the deployment of software to guarantee its operation in different environments, as defined in Rozanski & Woods . The deployment viewpoint applies to any system with a required deployment environment that is not immediately obvious to all of the interested stakeholders. Each software element in Ember.js imposes requirements for specific versions of third party software. Most of these require separate installation as they do not come in one, complete package. Browser support: After v2.0 Ember does not support IE8 or below to render its applications. These version requirements are not related to Ember.js, but we found them out when building it in our environment. Ember.js runs a state manager and reverse proxy on the web server. The node in the system can be divided into two categories: server and client. On the server side, Ember.js has limits on version issue which get deployed after a certain version has passed deployment tests. These limits are in place to protect services from both accidental and untimely crashes. On the client side, the network requirements are not specified. To deal with the variability of an ever changing environment, Ember has adopted a six-week release cycle, inspired by the rapid release cycle of Google Chrome . As described, this approach allows newly developed features to be carefully released when the community considers them ready to use. For versioning, Ember uses the semantic versioning convention . It means that new features and fixes for small bugs are added by point releases (1.1, 1.2, ...), whilst breaking changes are only introduced at major version numbers (1.0, 2.0, ...). The complete version history can be seen in Figure 9. Note that pull requests for new features are not expected in the GitHub repository because they move to Ember RFC (Request for Comment) for discussion purposes. Furthermore, new versions are also released because of new (or improved) documentation and depreciation. It means that for simplicity purposes, not all web browsers, plugins, features or add-ons are supported anymore. Support for Internet Explorer 8, for example, is available up to version 1.13, but is dropped from release 2.0 onwards #11313. For a complete oversight of all changes made to the Ember framework since 2012, please consider the Ember Changelog. Dealing with ever changing software is not easy. Therefore, Ember has installed several variability mechanisms to adapt to the changing environment. To denote variability mechanisms, a slightly changed definition derived from Puhlmann et al. (2005)  is used: "Variability mechanisms denote techniques for the derivation of software from software models". Puhlmann et al. also describes some commonly used variability mechanisms, to which will be referred. Note that we only looked at changes at runtime level, which comprises of adjustments done whilst the software product is already implemented. This is in contrary to product time changes, which refer to types of variability that are resolved during the implementation of a software product. Document changes are the simplest to deal with. Because of Ember&apos;s open-source nature, all documentation is publicly accessible. If document changes are needed, one can open a pull request to do so. The "old" documentation module will simply be replaced by a new one, when the request is approved. Puhlmann et al. denote this as replacement of components. If new documentation modules are needed because of the adoption of recent features, new documentation is simply added (addition of components). Note that "old" documentation is still being saved (see Ember Guide). If new features can be incorporated by adjusting the modular structure or adding new modules, a new release will be launched. Puhlmann et al. denote this as the addition of components. Compatibility issues are using the same variability mechanisms as described above. If compatibility issues are not important, then Ember relies upon the community to develop add-ons. If the issues are important enough, then they will be incorporated in future releases. Note that bug fixes are being dealt with only the last two mentioned variability mechanisms. Unimportant bug results in the closing of the pull request. Finally, if the framework is going to be deprecated, particular modules will simply be omitted, or parts of the modules will be adjusted. Puhlmann et al. refer this to omission of components. Ember.js uses an interesting version change technique, namely S3+ Redis deployment (also called as lightning deployment), which was introduced about a year ago. With this technique, developers can push static assets (version upgrade components) to Amazon S3 anytime, see Figure 10. Amazon S3 allows developers to have different versions of App.js anytime. However, only one of these versions is used in production, which is determined by index.html in Redis. This allows to release a new version of Ember.js when it is ready to be shipped, and this can be done easily by pushing the corresponding index.html into Redis. This new version of index.html is recognized by Reverse proxy, which picks up the corresponding asset from S3 and transfers the contents to the browser. This deployment technique switches versions lightning fast without any noticeable downtime for users. Developers have roughly two options to implement new features in their applications. One is to do it quick and dirty, which has its impact on future changes. The other option is to do it smart and robust, but this will cost money and time. Technical debt is a metaphor regarding the eventual choice of the implementation and its consequences . Ever since the development of Ember.js back in 2011, efforts were undertaken to manage and control technical debt of the Ember.js framework. To manage technical debt, for the development team, it was crucial to create a community to develop, build, and test Ember.js applications in an efficient way and make peer reviews possible using pull requests and issues. To do this, they first created Ember App Kit (EAK). EAK is eventually replaced by ember-cli, which is a faster, more user-friendly command line tool that made testing and peers reviewing even more efficient. Even so, technical debt is still present in the Ember framework today. Building time & usability: sometimes, if you have to do things quickly, one may write a single, large code in which loading the code becomes dependent upon the order of lines. "This is totally crazy", according to Penner . To manage this form of technical debt, Ember uses modules based upon ES6 module syntax. This makes testing easier and the application independent of the order of lines. SonarQube is used to analyze technical debt in the Ember.js framework in more detail. Only the source code inside the lib and packages folder are analyzed, as these folders contain the core files. SonarQube will raise an issue whenever a code violates certain rules of programming language used, as seen in Figure 11. Fortunately, no blocking issues were found. Blocking issues are issues with high probability to severely impact the behavior of the application in production. However, there still exists several critical and major issues, mostly about unused variables and functions. The critical issue represents either a bug with a low probability to affect the system or security flaws, whilst major issues deal with quality flaws, which can negatively impact developer productivity . Overall, Ember.js has got a low technical debt ratio, which means that the project is well-maintained. This conclusion is reinforced by the analysis of code duplication, which yields a low percentage of the total code duplication (14.3%). The code duplication for each component is depicted in Figure 12. Another interesting fact is that relatively most of the issues come from the code that handles routing as presented in Figure 13. Note that the size of the circle represents the technical debt. The link-to.js file is located inside ember-routing-views package. It has the highest issues, moderate technical debt, yet has few lines of code whereas basic_test.js, which is part of ember route testing package, has the highest technical debt and lines codes, but has a moderate number of issues. This could be a good opportunity for a new contributor to collaborate to resolve routing issues. Significant effort has been made by Ember to improve boot, rendering, and build performance. In addition to creating a performance subteam, the infrastructure work is starting at a pace to allow Svelte Builds—builds of Ember that have all code related to deprecated features removed. This allows developers who have eliminated the deprecation warnings in their code to benefit from a significantly reduced file size. The basic advantage of Ember is that it has slowly become a stable core on top of which developers can build web applications. Much effort is put into the “Stability without Stagnation" concept behind Ember and the Ember community demonstrates that, unlike other open source projects, Ember is mostly developed by the consumers instead of a giant corporation. So, the developmental stability remains without halt due to contribution from multiple users. While low-level API gives developers maximum flexibility, it does not always make it pleasant to build large apps. However, these building blocks have unlocked frameworks and libraries like jQuery, Ember, Angular, and React. By focusing first on raw capabilities before ease-of-use, the scope is constrained. It allows Ember developers to ship features faster, and by exposing just the building blocks, the experimentation in the ecosystem can continue with the help of developers without hampering backward compatibility. The same thing is starting to happen in Ember. Two illustrative examples are FastBoot and Engines. The end of the expedition has led to the conclusion that the Ember.js framework has an interesting, but complex architecture. We believe that our chapter can help the reader to contribute to the Ember.js framework by structuring the (architectural) complexity, showing its functionalities and deployment and reveal its potential weaknesses. Starting with the involved stakeholders, we clearly showed that there are two important stakeholder groups within the framework, namely users - the developers that use and support the framework to build their own web applications - and developers, those who continuously improve the framework. For contributions, within the last mentioned group Robert Jackson (@rwjblue), Stefan Penner (@stefanpenner), Tom Dale (@tomdale) and Kris Selden (@krisselden) are the most important to contact in Ember’s Core Team. By developing a broader view, the frameworks relationships, dependencies and interactions with other systems and parties appeared. Ember.js benefit from numerous of third party software to support their framework, compatibility, community and developers. Furthermore, it is shown that as a framework, Ember.js makes use of the Model-View-Controller (MVC) design pattern, which mainly relies upon models, controllers, views, templates and routes. 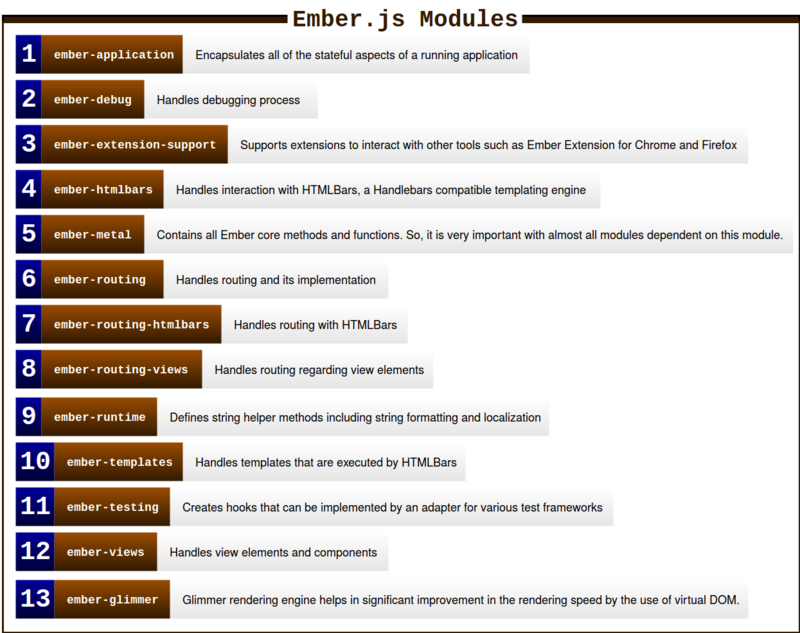 We have also shown that Ember’s modules are clearly defined, but have extremely complex interactions with each other. Moreover, a generic insight in the main features of the framework along with the perspective of the stakeholders is presented. It appears that Ember.js has dozens of features, mainly for their users. Finally, we have shown the way Ember.js is deployment, its evolution, why the framework changes and how it manages the changes over time. It comes out that Ember changes because of adjustments in both supporting languages and supported web browsers. After analysing Ember.js from different viewpoints and perspectives, it can be clearly seen that the framework has improved over time. Though, there are still points of concern left. The dependencies within the modular organization make it hard to change specific components because it can be difficult to predict its consequences for other modules. This clearly has a negative impact on both scalability and maintainability of the Ember.js framework. In addition, the technical debt analysis showed that fortunately no blocking issues were found. However, there still exists several critical and major issues, mostly about unused variables and functions. Another fact is that relatively most of the issues come from the code that handles routing and testing. 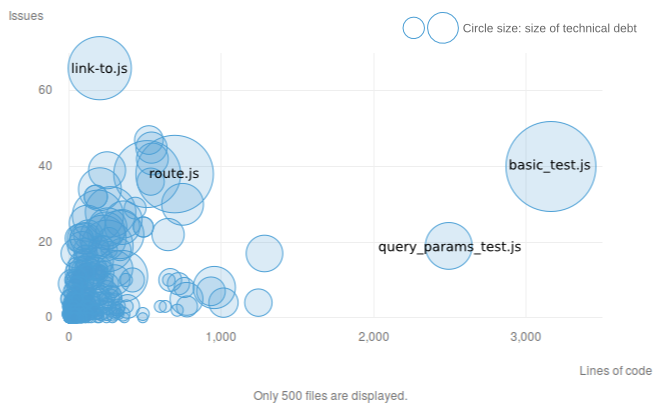 To conclude, we believe that in both link-to.js, route.js (both handle routing) and basic_test.js there is still major room for improvement and contributions. Though, from the intensive study, we are convinced that collaborating online on a large framework like Ember.js really moves the framework forward. 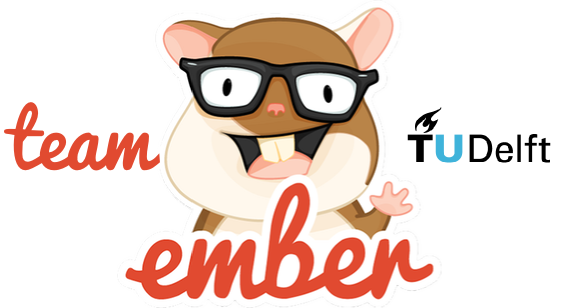 Ember.js has hundreds of passionate and, above all, very intelligent contributors and warmly welcomes new contributors and developers. GitHub contributes to this as well, by supporting communication, cooperation and a structured way of working. To conclude, if you are going to build a web application using the Ember.js framework, we hope that we have encouraged you to make contributions. It is worth trying, however, small it may be. Rozanski, N., & Woods, E. (2012). Software systems architecture: working with stakeholders using viewpoints and perspectives. Addison-Wesley. Puhlmann, F., Schnieders, A., Weiland, J. & Weske, M. (2005). Variability Mechanisms for Process Models: Process Family Engineering in Service-Oriented Applications (PESOA).